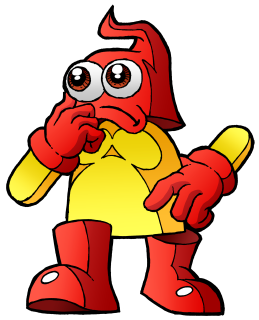 In Volume 4 Plok is is captured by the Zobian protectors of the Flea Queen, and taken back to System Z to face trial for the crimes he committed in the SNES game. We see Plok pumped up to muscle-bound proportions, and then shrivelled up to a saggy prune. We discover Grandpappy Plok's vast, secret underground lair, and what's going on with Grandpappy's Statue? 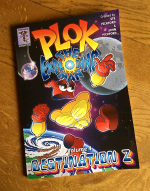 The fourth Plok comic strip edition collects episodes 77 to 101 of the webcomic and includes many exclusive extras. » View all 25 episodes of Volume 4 as a single long webpage. All 25 episodes of Volume 4 are available to read - for free! - right here. #77 You And Whose Army? Who is Wubba's mysterious new friend? Don't forget to use your vote, people! Charli-erm, Plok gives his team a pep talk. Plok admits to ballot rigging and electoral fraud. Plok is hit! Oh no, hang on, he's fine. Plok is taking his Smash Bros training very seriously. The gang take a break to watch videos of games. Plok gets on the blower to the Big N.
Remember that statue that was wobbling about a month ago? Zob down, but not out. A capture, a rescue and an introduction. You remember Captain Skint. From episode #50. The ZX SpectraScope. Better than a Vega. In the olden days things were black and white by choice. Back home the gang worry about their captured friend. Hey, there's nothing wrong with reusing assets. Captain Skint explores the mysterious underground base. Look at all the detail on that map! Who knew statues could speak latin? Colouring books are for adults as well as kids these days. Plok arrives at Zob and Xöb's home planet. Rockyfella reveals that he can communicate across the stars. Who will defend Plok from these wild allegations?